A new vertical-axis wind generator manufactured and patented by WindUp, in collaboration with ISB for rolling components. The new vertical-axis wind generator manufactured and patented by WindUp, in collaboration with ISB for rolling components, is the result of over two years of attentive research and design, in compliance with a policy of duration in time and material recycling. 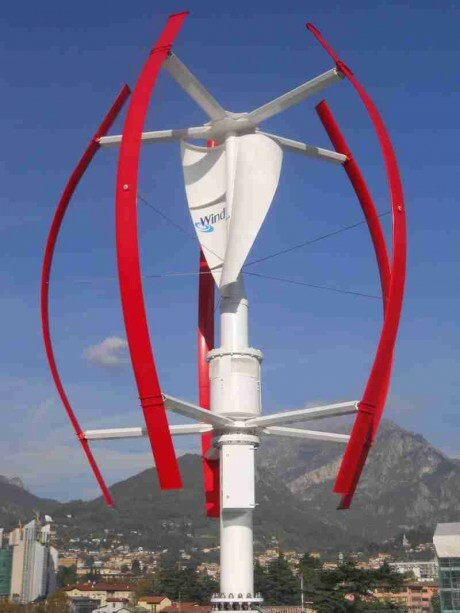 The turbine represents a modern interpretation of the centuries-old art of drawing energy from the wind; particular attention has been paid to aesthetical design and, thanks to the absence of noise and to the very low maintenance, it is suitable for the integration in urban contexts where the matching of technology, architectural elegance and eco-sustainability has become mandatory prerogative. In a constantly expanding market and in a legislative ambit that boosts the use of renewable sources for the dislocated production of electrical energy, mini-wind power can represent a valid support for the by now consolidated photovoltaic sources. With the mini-wind term we identify, consistently with what provided for by Italian regulations, the aerogenerators for the production of electrical energy with size included between 1 and 200 kW. These systems of transformation of the wind energy into electrical energy are very similar to bigger size ones but they have the possibility of starting producing energy also with wind speeds around 3 m/s (about11 km/h) against 5 or 6 m/s of bigger systems and with much lower investment costs. A team of engineers with complementary competences gained in the aerospace, mechanical, electronic and energy sectors, have shared their specific decennial experience to implement an innovative wind turbine, based on new concepts. With the term mini-wind power we identify, consistently with what provided for by the Italian regulations, the aerogenerators for the production of electrical energy with size included between 1 and 200 kW. The choice of the vertical axis instead of the traditional horizontal axis provides several advantages. Besides having higher transformation efficiency, in vertical-axis turbines mechanical or electronic systems are not necessary for the alignment of the rotor in the direction favourable to the wind or an adjustment of the blade pitch depending on relative speeds. Besides, the proximity to urban centres, close to high buildings, favours the development of turbulent and chaotic currents that make horizontal-axis turbines unsuitable and ineffective; on the contrary, in vertical-axis turbines also updrafts, disordered or anyway oblique currents equally contribute in the production of electrical energy. Finally, the advantage of having a direct coupling on the generator without gearboxes makes these machines reliable in time with minimum maintenance interventions. The turbine is of hybrid typology and integrates the benefits both of “Savonius” and of “Darrieus” models. The Savonius rotor, positioned in the centre, is provided with blades that, in plan view, take a particular S-shape and that exploit the principle of the aerodynamic resistance to create momentum to the shaft; at low speed it has a trigger with a surprisingly high torque, which makes it useful for the initial pickup of the wind generator starting up. To assure a smoother and very silent operation, the blades have been twisted along the rotation axis according to a helical shape. The blades of the Darrieus rotor are instead real “wings”. The operation principle is therefore similar to that exploited in the aeronautical field, thanks to which the airfoil section immersed into a fluid (represented by the relative wind), due to the pressure difference between “spine” and “belly”, generates a force, known as lift. With an opportune choice of the profile, of its pitch angle (wing incidence) and of the blade geometry in its three-dimensional development, it is possible to exploit the lift to generate a high rotation torque of the turbine axis, up to reaching 5 kW rated power with 12 m/s of wind. For Savonius they have studied a profile that grants a “cut in” for winds of 2.5 m/s to the detriment of performances with higher wind and rotation speeds, in this way limiting anyway the sizes and maintaining a “streamlined” shape with diameter/height ratio equal to ½. 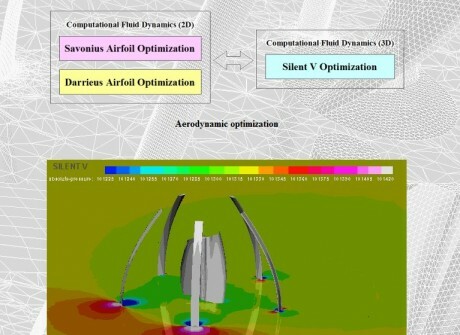 For Darrieus, the complex aerodynamic project, carried out with the aid of the most sophisticated computerized instruments, has called for several optimization cycles on profiles. 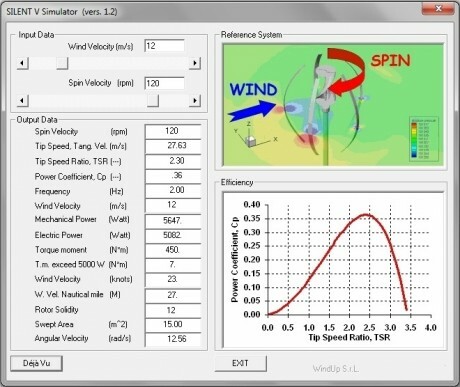 With parallel analyses carried out on various PC connected one another they created a virtual wind tunnel able to simulate the real behaviour of the whole rotary part. The final result has been a rotor able to develop powers with efficiencies that classify the turbine by WindUp among the most efficient aerogenerators available on the world market. The rotor can develop powers with efficiencies that classify the WindUp turbine among the most efficient aerogenerators. The turbine structure is very simple, from the point of view of components, machining operations and assembly. Minor number of components means in fact lower costs but also minor maintenance, and especially lower weight, frictions and inertia permitting a great reactivity and sensitivity to the lightest currents. The only moving mechanical parts are in fact the bearings supporting the turbine shaft. To this end, in design phase, the technical staff of ISB engineers, thanks to the know-how gained in application engineering ambit, gave a fundamental support in the choice of the bearings to be used, thus permitting to maximise the rotation smoothness. The turbine is then equipped with a complete kit of ISB rolling bearings, with cages suitable for the application, which grant the structural safety under the action of strong air loads. The turbine is equipped with a complete kit of ISB rolling bearings, with suitable cages for the application, which grant the structural safety under the action of strong air loads. The whole support structure (excluding the generator shaft) and the totality of the aluminium part is made of very resistant aluminium alloys which make them similar to steel in terms of performances, with all the advantages of that material: extreme lightness, simple machining, resistance to corrosion but, most of all, high availability and recyclability, with unique characteristics of duration. 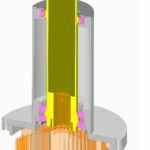 The aluminium elements as well as all turbine components are adequately treated on the surface with specific anti-corrosive and anti-erosive protections for the installation in marine or desert environments. 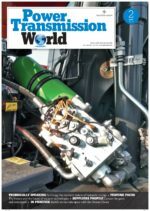 La ringraziamo per aver apprezzato i contenuti della nostra rivista digitale Power Transmission World.